With millions of articles published everyday, how do you produce “breakout” content? How do you ensure your content doesn’t become part of the dreaded clutter spanning much of the Internet? How can you be sure your content doesn’t join the humongous list of sad blog pages with lonely lives only to be visited occasionally by a bot or two once a week? It is not simple, really. But we can help you get better. When researching what kind of content works well, you need all sorts of information on articles. Apart from providing the article title, Social Animal provide you the names of authors, date published, number of words, a headline analyzer (described later), a list of the main keywords along with the counts of shares it received on all major social networks. Social Animal’s incredibly detailed results let you peer into insights well beyond just the article’s title or the number of times it was shared on social media. You can click on any keyword found in the article and see more top-performing articles on the keyword. Social Animal has analyzed millions of articles and keywords. 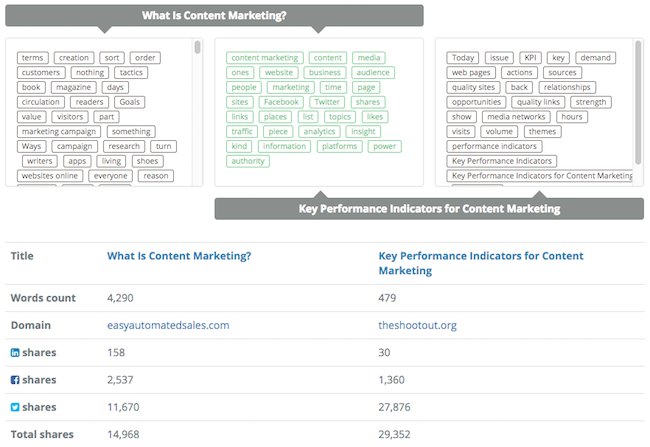 This means that we know a lot about pretty much any given keyword’s performance in the content universe. From letting you know when to publish your article to get the best possible outcome to the right title and article lengths, Social Animal’s Insights module can serve as a quick checklist of items to adhere to while writing and publishing your content. Just because certain articles performed really well, that doesn’t mean they deal with the same subjects. While two articles might have a central subject, they might have two completely different takes on it. They might also be talking about other things (secondary keywords) in relation to the primary subject. Social Animal’s Compare Articles feature lets you select any 2 articles for a quick comparison. You can see things they talk about in common and other things they talk about exclusively. This feature lets you look well beyond simple metrics like share counts peering into the very threads of the articles being compared. Compare Articles is a huge time-saver because now you won’t have to read both articles in their entirety and take notes. All keywords are pre-analyzed and right there for you. Article headlines or titles play a very important part in an article becoming popular. While analyzing articles that made it to the top, you might want to get some insights into how their headlines are constructed. 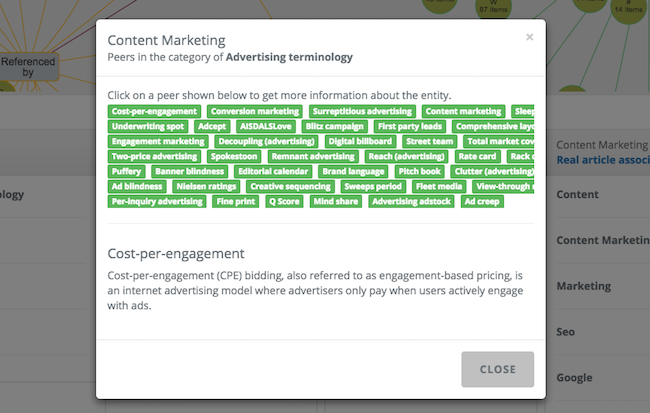 Clicking on the Headline Analyzer tool shows you Social Animal’s detailed analysis of any headline. Curating content is a great and proven way to both build and engage an audience. Curation can also supplement your original content creation activities. For the curation of content, Social Animal is easily one of the best tools. We say this because it lets you get to exactly the kind of content you are looking for with it’s sophisticated deep search capabilities. You can get to articles by title, author, domain name, time published or shared most. You can also search by what the article talks about, not by just words in the title. Many authors try and create click-baity titles, but Social Animal’s keyword search feature lets you fish out articles that are tough to discover via other tools in the market. 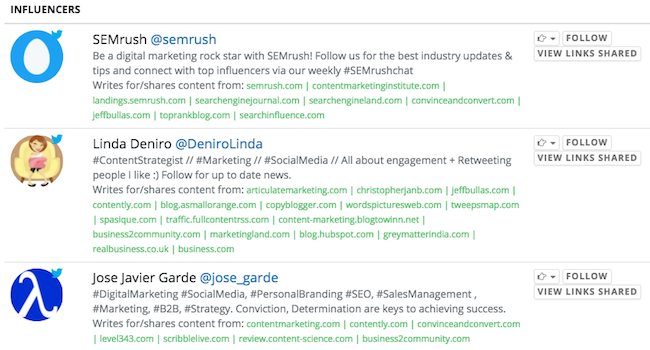 Social Animal is all about meaningful searches powered by keywords. Titles can be very misleading and don’t truly reflect what the article is really about. With keywords on the other hand, you can seldom go wrong. In all search results, keywords from the article are displayed. You can compare any 2 articles and see what their common and unique keywords are. 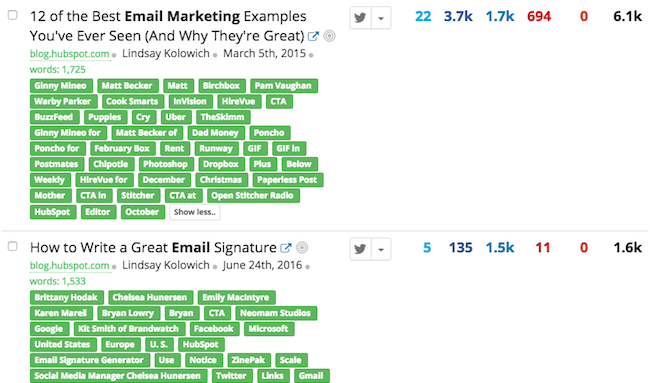 This way, you don’t have to read and analyze both articles, saving you loads of time. You can also initiate a search for articles containing a particular keyword by clicking on any displayed keyword in the UI. 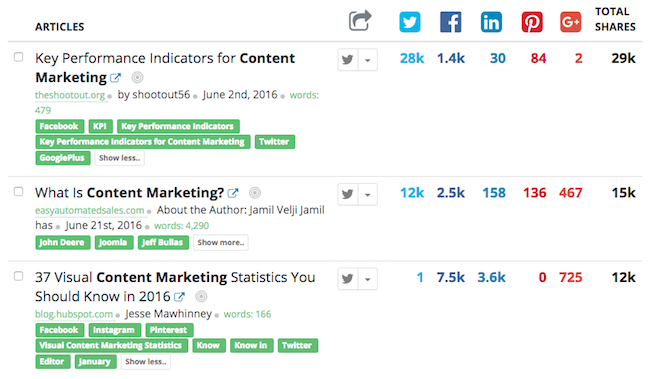 With Social Animal, you don’t constantly have to keep searching for keywords you care about. You are proactively informed about articles that are doing well via two separate, but related mechanisms. The Mashboard is an area in the UI that you can quickly peek at no matter where you are in the Social Animal user interface. You can also hide it and get it out of the way as you please. 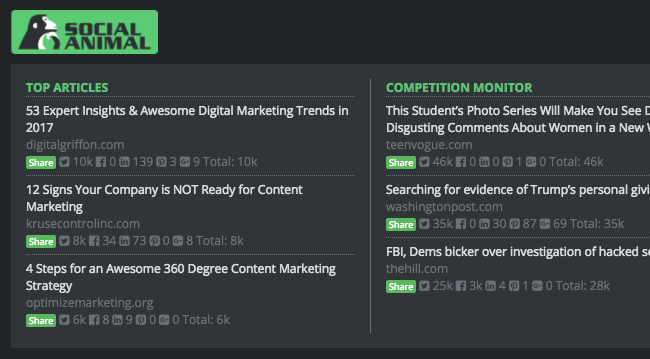 The Mashboard shows you top articles, competitor mentions and potential new influencers updated every few hours. Social Animal works hard behind the scenes to keep you updated of all the things you should be keeping a tab on, saving you a ton of time. 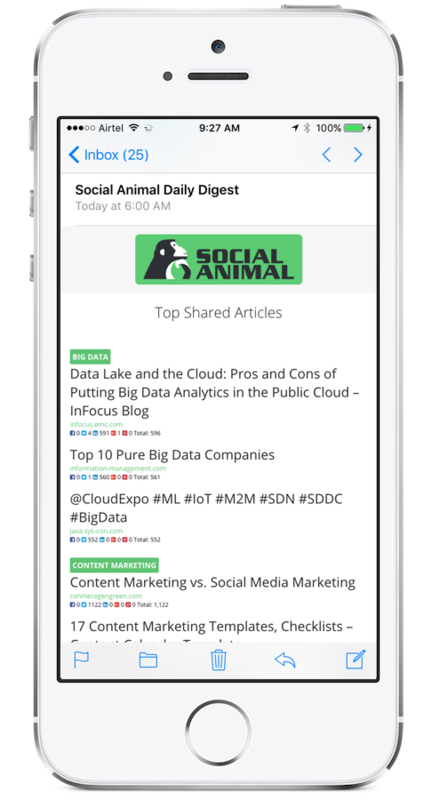 Once you’ve set up keywords/topics you are interested in, Social Animal will send you personalized digest emails every day with recent top performing articles and potential new influencers we found for you. Putting in effort to amplify the reach of your content is as important as the effort you put into creating your content. And no one else but influencers can amplify the reach of your content better. Social Animal comes with a great influencer search tool that lets you get to the best in the business for pretty much any keyword. Social Animal uses a sophisticated algorithm to get you the best possible influencers for pretty much any keyword. Since both authors and curators can be powerful influencers, we bring to you, both. You can see domains they write for or share content from, see links they shared and even follow them on Twitter right from the Social Animal UI or tweet out to them. There is no need to search for articles and influencers manually all the while. Social Animal’s proactive reporting features like the Mashboard and Daily Digest Emails always keep you in the know. These features are designed to deliver highly personalized information only meant for you. This saves you a tremendous amount of time everyday searching Social Animal manually. Inspiration they say, can strike anywhere. But you can get oodles of it right here in Social Animal’s InspireMe feature. Type in the keyword, hit the search button and be inspired! 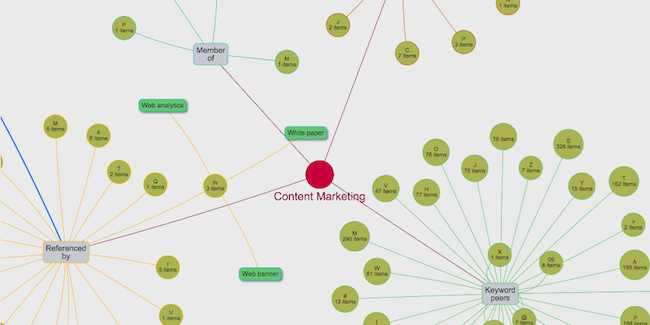 See the topics that connect to and connect from your keyword of interest. You can click on any node and get a short description of any topic as well. This will provide you with fresh ideas for your articles, that no one has covered before. Explore topics in the same category as your keyword, further expanding your inspiration horizon. This opens up amazing possibilities, giving you relevant but unexplored ideas. While any keyword could be the central topic that articles revolve around, Social Animal uncovers secondary keywords for you. 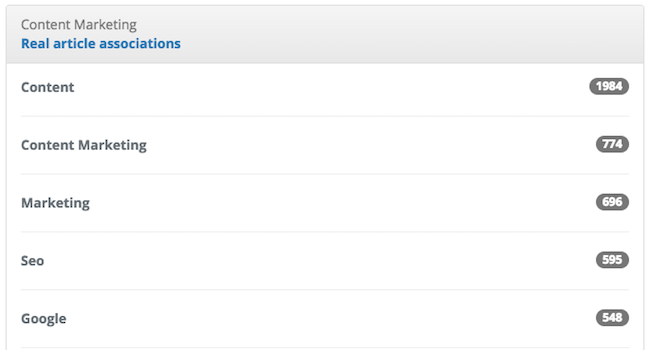 Through InspireMe, Social Animal shows you all the secondary topics that are covered for a given primary topic. Got to keep a tab on them, competitors. Any worthy mentions in articles could be a way for you to uncover new influencers or might keep you informed of something new they might be doing. 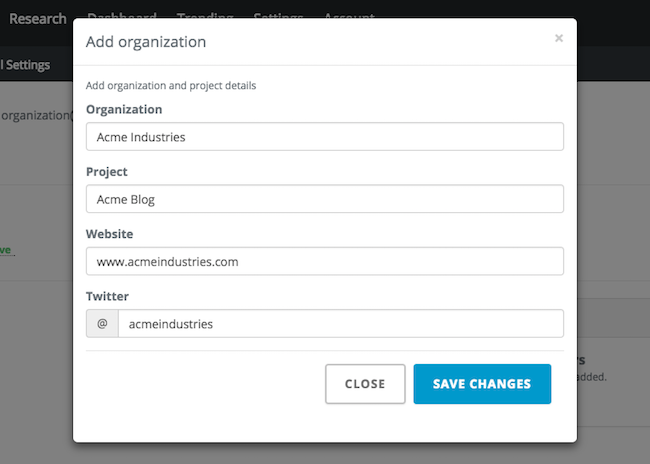 In Social Animal, keywords and competitors you want to monitor are grouped under organizations and projects. Any organization you create can have multiple projects under it and those projects in turn can track multiple keywords and competitors. This organization cleanly separates out your tracking for you. Once you’ve setup keywords and competitor details you want to monitor, Social Animal gets into business constantly looking for any keywords that are performing well or for any worthy competitor mentions. This information is then made available to you via the Mashboard which is updated every few hours or via the Daily Digest email. You can try Social Animal for free without a credit card for 15 days. We’re confident you’ll see great value and plug Social Animal right into your content marketing workflow. Try now!